June 14, 15, 16 & 17, 2017. DD wrote: “So what’s going on with the chairs? Often in theatre we see the actors standing on stage at a jaunty angle to the ‘fourth wall’, never looking behind them and always talking so that their expressions can always be seen. The danger with this traditional approach is that, for me, there is always an artificial barrier between the audience and the actors. When you perform in the round there is no ‘fourth wall’. Actors stand more naturally and face each other haed on. In the round the audience is drawn into the play in a much more intimate way and as such feel part of the action themselves. You may see someone talking with her back to you and your attention is naturally focused on the other actors listening to them. Performing in the round lends itself to intimate, realistic setting and as such, Yasmina Reza’s play about the dramatic destruction of pretensions of well-to-do liberals is a perfect choice. The Wick Theatre Company is set to perform Yasmina Reza’s play God of Carnage. The play follows the story of four parents who get together to discuss a playground altercation between two small boys which has left one of them with a couple of broken teeth. Veronica and Michael, whose son Henry suffered the damage, welcome Annette and Alan, the parents of Benjamin the attacker, into their home, determined to treat the whole situation in a civilised manner. At first all goes smoothly, but as drink starts to flow, and high powered corporate lawyer Alan answers incessant business calls on his business calls on his mobile phone, politeness and the couples spar against each other. Yasmina Reza’s play was a success in the original French language, and it won both the Laurence Olivier Award for best comedy and the Tony Award for best play 2009. Performances of will run from Wednesday, June 14 to Saturday, June 17 at the Barn Theatre, Southwick Street, Southwick. God of Carnage by Yasmina Reza is the next challenge for Wick Theatre Company. Spokeswoman Judith Berrill sets the scene: “When a playground altercation between two small boys leaves one of them with a couple of broken teeth, their respective parents get together to discuss the matter. Veronica and Michael, whose son Henry suffered the damage, welcome Annette and Alan, parents of Benjamin, the attacker, into their home, determined to treat the whole situation in a civilised manner. At first all goes smoothly, with the couples trying to get to know each other. But as the drink starts to flow, and high-powered corporate lawyer Alan answers incessant business calls on his mobile phone, politeness goes out of the window and the couples initially spar against each other. Then the men gang up against the women, spouses switch sides as the arguments continue and chaos reigns. 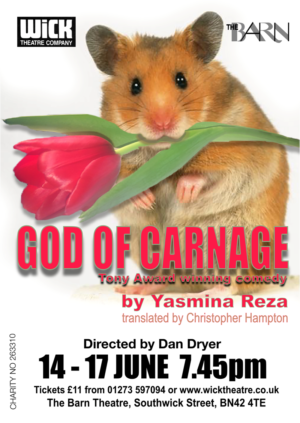 Performances of God of Carnage run from Wednesday, June 14 to June 17 at the Barn Theatre, Southwick Street, Southwick. Watching a seemingly civilised discussion fall apart should not be as funny as it is in God of Carnage. During Wick Theatre Company’s marvellous performance at the Barn Theatre on Thursday, I almost felt guilty laughing so hard at a situation that perhaps should not be funny at all. Benjamin has hit Henry with a stick, breaking two teeth, and the two sets of parents have gathered to talk over the consequences. Michael and Veronica Novak, played by John Garland and Sarah Charsley, have prepared a statement about the injuries to their 11-year-old son. Alan and Annette Raleigh, played by Guy Steddon and Rose Hall-Smith, have been invited round for tea and cake and at the start, everyone is being very reasonable about it all – or trying to be. Local references were woven in, like Buckingham Park in Shoreham, Lancing Rec and the British Airways i360 in Brighton. Already an intense situation, the meeting was made more so for both actors and audience by performing it in the round. Director Dan Dryer said this removed the artificial barrier of the stage and meant the actors could stand more naturally. It is true the foursome moved more fluidly than they would have on a stage facing forwards, so we watched as if from a bird’s eye view on a real living room, and it made it more intense for them, as they were so very close to the front row seats. That proximity may have been the reason for the few stumbled lines, though these minor mistakes did little to affect the overall sense of brilliance in the performance. Sarah stood out for her performance as the arty mother who likes to be in control. Sarah was definitely in control of the part even if the character Veronica was not as in control as she appeared! The reasonable Veronica was trying to be, the more unreasonable she became. Wick stalwart John Garland took on a bigger part than usual and was impressive as the apparently mild-mannered Michael who turned out to be a bit of a bully himself. Guy, another Wick stalwart, is known for his big performances but was reasonably restrained as lawyer Alan, which kept the balance perfect. Rose gave a strong performance as Annette and her temper tantrums when he drowned her husband’s phone and ripped up the tulips were a joy to behold. This witty play is a biting look at modern parenting where acceptance of one’s child’s faults is denied. Two couples meet to sort out a playground scrap that has left Veronica and Michael’s son with two broken teeth. Annette and Alan, parents of the assailant, have been invited to discuss the way forward. Soon the veneer of civilised behaviour begins to crumble with tensions emerging between the couples that reveal cracks in both marriages. Their behaviour disintegrates and they act like children at their worst. Director, Dan Dryer, wisely decided to mount his production in the round which adds intimacy, with the audience being drawn in as though they are in the same room as the combatants. The play offers the four actors very strong parts that requires each of them to switch between accused/accuser; attacker/pacifier. All four have nailed their characters and move effortlessly through their varying emotional changes. Sarah Charsley’s Veronica, full of neurosis, is like a dog worrying a bone, whilst Rose Hall-Smith gives Annette an air of liberal condescension and delivers a most realistic vomiting scene. John Garland and Guy Steddon contrast beautifully as the husbands – an unimaginative dullard versus a smooth talking immoral lawyer. We wear clothes as we are ashamed or bashful of our bodies and we assume liberal pretentions because we are shamed by our true voice within. How wonderfully and uncomfortably aware Yasmina Reza’s play God of Carnage brings this into hilarious focus and it’s clear to see why it won a Tony award and Olivier for best new play. The premise, in brief, is that two couples are discussing what to do about a violent encounter between their school aged sons which resulted in a loss of one and a half incisor teeth. However what we are really seeing is a window into liberal middle England countenancing the facade that mankind is evolved and civility reigns – simply, the play suggests, not true – as beneath a thin veneer of politic we are all still savages who delight in the carnage that is primeval and inherent in humanity. Having witnessed the on stage craft and performing prowess of Dan Dryer on more than one occasion at Southwick, it came as little surprise that his production of this great material was equally nurtured brilliance. He is clearly a deft director too, who respects his actors enough to give them the space and freedom to bring the depth and breadth of reality to their characters that makes the piece come alive. Sarah Charsley, John Garland, Rose Hall-Smith and Guy Steddon all delivered delightfully real performances with perfect pace and some genius moments of comic timing. It is rare to enjoy watching a four handed piece so evenly matched in talent and so well crafted in execution. Wick Theatre raises the bar again!